Green aventurine jade stone scraping massage tool made of chakra healing green jade stone, for lymphatic massage, anti-aging facelift massage, anti-wrinkles massage, facial massage, trigger point & chiropractic massage, acupuncture therapy, skin care treatments, muscles and joints soreness relax, detox relaxation and stress relief. Finishing: Fine finishing, with very smooth surfaces and edges that will never scratch and hurt your skin or cause bleeding. 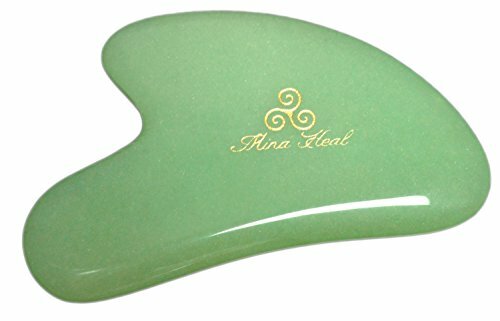 The highest quality Gua Sha massage jade stone tool. Application: facial Gua Sha lymphatic massage for skin detox and rejuvenation & beauty. JADE GUA SHA SCRAPING TOOL: Manufacturer direct and new launch. Very easy to use functioning guasha massage & scraping jade tool for women for anti-wrinkles, anti-aging facelift, Hayou method, cosmetic self-treatment. MULTIPLE POINTS AND EDGES: Use the points and edges of this tool to increases blood flow and microcirculation in the soft tissue to gain healthy skin, skin detox and rejuvenation. 2-corner design. CHAKRA HEALING GREEN JADE STONE: Made of 100% natural chakra healing green jade aventurine stone. Double effects of massage and healing at the same time. DESIGN BASED ON TRADITIONAL EXPERIENCE & ERGONOMICS: Beautifully designed based on both experience over 2000+ years and modem ergonomics. BEAUTIFUL CARRY & STORAGE POUCH: Comes with a beautiful pouch for storing and carrying.